WHB (but not from my garden...): Saffron! | What Smells So Good? 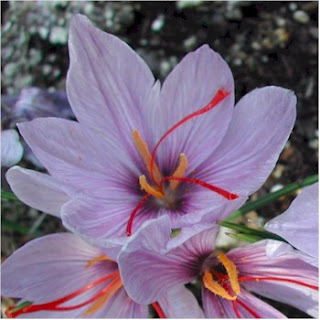 Saffron are the stigmas from the crocus sativus flower (see image below). There are only 3 stigmas (referred to as saffron threads) per flower. Saffron is hand harvested so you can understand why it is so prized and so expensive. It takes about 13,125 threads to weigh one ounce. Crumble saffron into water and stir. Set aside. Wash and cut potatoes horizontally into about 3/4" slices. Pat dry. Heat a drizzle of olive oil in a large high-sided skillet or pot. Brown potatoes 4 minutes per side, keep as one layer in pan. Add saffron water, salt and pepper and rapidly simmer 7 minutes. Reduce heat and simmer until potatoes are tender and water is mostly evaporated, about 15-20 minutes. Sounds very good. I think saffron has a wonderful flavor.